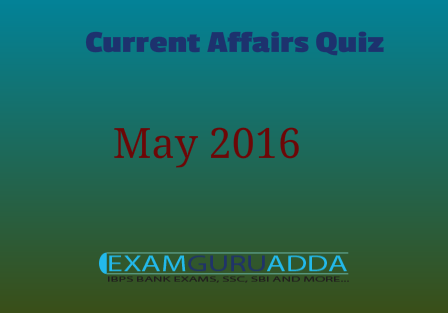 Dear Readers Examguruadda.in presents Current Affairs quiz of 21 May and 22 May 2016 that cover important current affair events. Current Affairs quiz prepared according to the latest Bank, SSC and other competitive exams. 1. Who was appointed as UN special envoys for El Nino, Climate? 2. Who was elected the president of the Board of Control for Cricket in India (BCCI)? 3. Which state government of India has launched PEHAL programme for raising education standards? 4. Who is the author of the book “Dr. Ambedkar: Life and Mission”? 5. Who is the author of the book “Curfew in the city”? 6. Srabani Nanda is associated with which sports? 7. Which Emmy award-winning English-born actor died at the age of 96 recently? 8. Turrialba volcano which erupted recently at which place? 9. Union Government launched an indigenously developed affordable faecal incontinence management system. It is called as.......? 10. The Red Line campaign that was in news related to.......? 11.Which city hosted the 1st World Conference on Tourism for Development?